Camel Up won the 2014 Spiel des Jahres (Game of the Year) award, a prestigious honor previously bestowed on classics like Settlers of Catan and Dominion The choice was notable because Camel Up is so unlike the games that have won this award in the past. Camel Up is very much a family game, a light strategy offering with a heavy randomness component, the type of game you play entirely for fun and will only dislike if you start to take it too seriously. 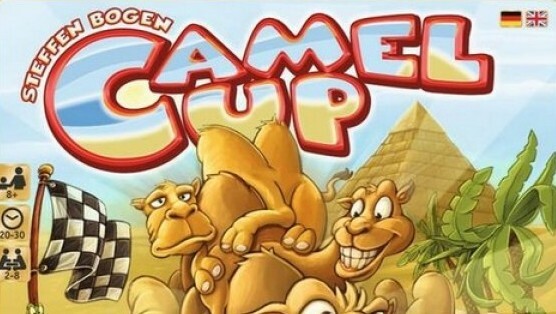 It is seriously fun, if you’re into that sort of thing, but the gamer who prefers Agricola and Caylus will consider Camel Up a trifle for the kids. The Camel Up itself is a camel race around a small track of sixteen spaces, with five camels of different colors vying for the title. From two to eight players play bettors on the race, and can place short- and long-term wagers on which camels will finish first or second in a specific leg of the race, or which camels will finish first or last overall when the race ends. That means players aren’t tied to specific camels—you can bet on the orange camel to win one leg, the green to win the next one, and the blue to win the whole thing. Betting is fluid and should include what other players are doing as well as where you think the camels are headed. When the game ends, the final bets are tallied and the player with the most money is the winner. The way the camels move is the game’s most unique mechanic. 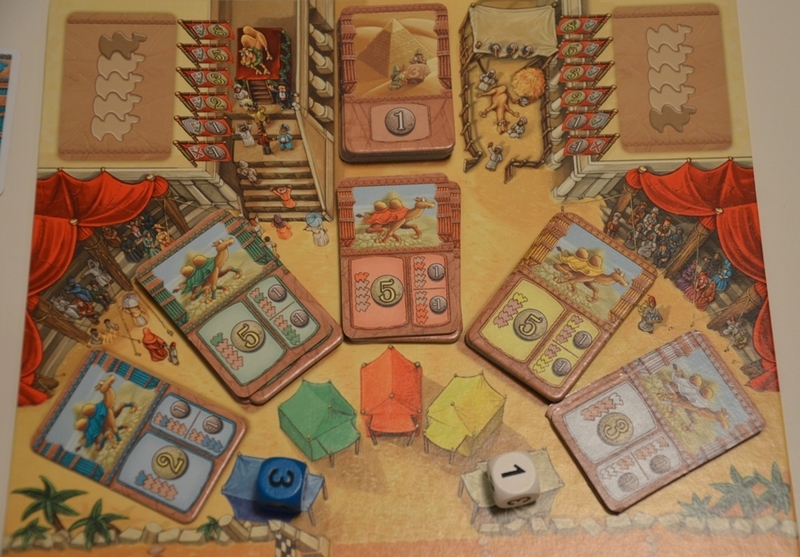 Each camel is represented by a die with the values 1, 2 and 3 (on two sides apiece), and all five dice go into a cardboard pyramid that, when placed upside down on a hard surface, will allow for the release of just one die. Therefore, one camel moves per die roll—the player choosing to use the pyramid and roll the dice gets one pound coin as an incentive—and when all five dice have been rolled, that completes one “leg” of the race, and all bets on that particular leg are scored. The dice return to the pyramid, the leg betting cards return to the board, and the next leg begins. 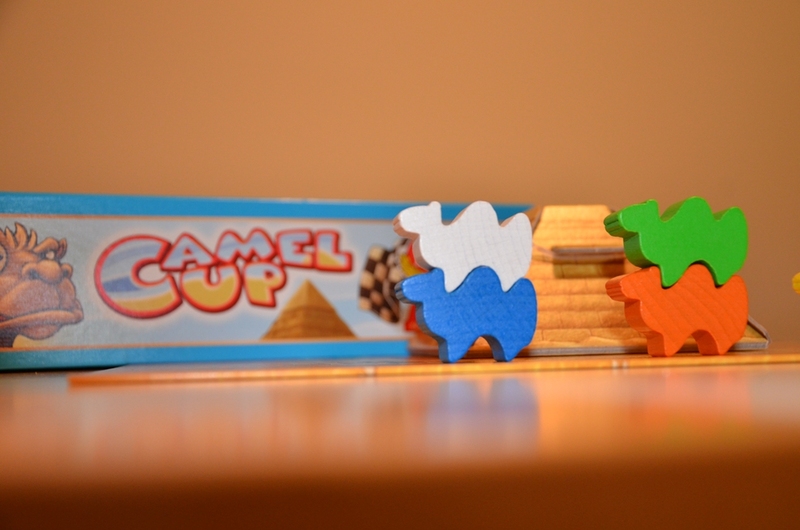 The camel tokens—they’re meeple-like, but I can’t call them meeples—are stackable, so when two camels occupy the same space on the track, they form a little tower of camels. When a camel with one or more others on its back moves, he carries all of them forward, so a camel of one color may hitch a ride on another’s back before its own die has come out of the pyramid on that particular leg. Working out how each camel might move on that leg is probably the game’s biggest thought component, and playing it with my eight-year-old daughter, I noticed that was the part that most engaged her brain. She was secretly enjoying working that out and getting the right answer. Bets on a particular leg are limited by the cards found on the board—there are only three for each camel, with payouts of five, three and two pounds if that camel finishes first at the end of a leg, and one pound (on any card) if that camel finishes second. If the camel finishes third or lower, the player loses a pound for each card he’s taken in that leg. The bets on the entire race work very differently, however. Each player begins the game with five cards with his character on them, one card for each camel color. At any point, a player may place one of these cards on the board spaces for bets on the ultimate winner of the race or the ultimate loser—face-down, so other players don’t know what bet(s) you’ve placed, and irrevocable. When the game ends, these two piles are scored from the bottom (first) card up. The first player to play the card showing the winning camel’s color gets eight pounds at game-end; the next player gets five pounds, then three, and so on. The same bonuses apply to the players who placed the cards showing the last-place camel’s color. Any cards placed on the wrong camel in either pile cost the bettor one pound apiece. So you can play all five of your cards between the two piles, and as long as you place the right camel’s card first or second in either pile, your net will be positive. Of course, you’re aiming for more than that, but it sets a nice floor for younger players who might hate the idea of losing money at the end of the game. On each turn, a player may roll the dice, take a leg betting card, place a betting card, or place his/her desert/oasis tile somewhere on the track. This tile grants the player a one-pound bonus when any camel lands on it, and moves that camel back one space (if the desert side is up) or forward one space (if the oasis side is up). That gives players a faint and unreliable way to influence the outcome of the race, but we’ve never found it terribly useful. My daughter adored the game from the first go, with one small complaint about the gameplay. She enjoyed working out the logic of the camels’ likely progress and placing bets, although I think she enjoys rolling the dice in the pyramid too much and should probably take more short-term cards than she does. Her one complaint is that she often feels like her turn is “skipped” because she’s the first player to go (the youngest player gets the start token on the first leg, then passes it to her left) and would frequently find that subsequent legs would end before her turn, only to have the next turn go to the new start player. It’s the kind of thing that would only matter to very young players. We found games took under 30 minutes, even with four players, and one game took only ten minutes because the die rolls pushed one camel around the track so quickly that the game ended before we’d even placed many bets. With two players, the game felt too light; the third betting cards (worth two pounds apiece) probably shouldn’t be used at all in a two-player game, and the lack of competition for betting cards reduces the tension of the game substantially. Four players was when the game really started clicking, because grabbing the betting cards for the current leg became a chase, with fewer cards than players. Eight might be too crazy, but then again, if it’s a couple of adults and a bunch of kids, it might be hilarious—and that’s what makes Camel Up a strong game. It’s a fun boardgame that doesn’t feel stupid to the adults in the room (looking at you, Sorry! ), and it requires some skill and thought despite a high luck component. I think the Spiel des Jahres judges got the award wrong; Splendor is the better game, more elegant with a better balance of skill and luck. If there were a category specifically for family games, however, Camel Up would be a worthy winner.